HOW LONG DOES THE RIDE TO THE REEF TAKE? HOW LONG ARE YOU AT THE REEF? 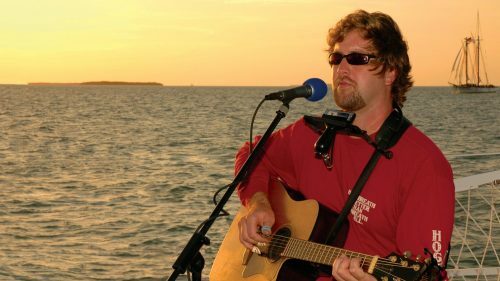 DO YOU RUN TOURS EVERY DAY? CAN WE TAKE OUR (CUTE LITTLE) PUPPY? No, the coast guard won’t allow it. We’ll hold it on the dock until trip returns. CAN WE TAKE A WHEELCHAIR? CAN WE TAKE THE SCOOTER? 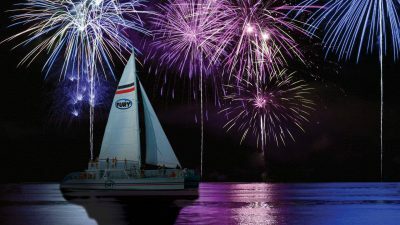 It is a 65 foot catamaran, air-conditioned, enclosed, with a shaded viewing cabin, snack bar, sundeck, and 2 restrooms. CAN WE BRING FOOD, DRINKS? Yes, anything is welcome, including alcoholic beverages. ARE THERE LIFE JACKETS FOR BABIES/CHILDREN? Yes, we have life jackets for everyone. Of course, you can sit or stand while viewing. HOW MANY PEOPLE CAN SEE AT ONCE? 110 people can see at once; we never take more than that. 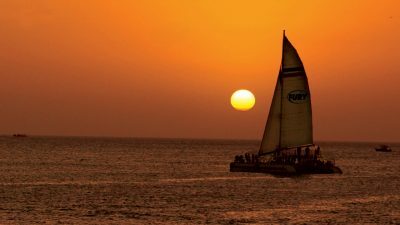 DO YOU WATCH THE SUNSET FROM THE BOAT? Yes, on the sunset trip only. 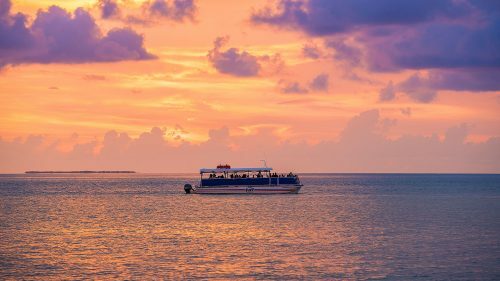 CAN YOU SEE THE REEF ON THE SUNSET TRIP? Of course, the sun is still high in the sky and viewing is the same as during the day. DO YOU STILL RUN TRIPS WHEN IT RAINS? Yes, the rain does not affect this trip and we do run as normal (unless the captain determines otherwise). DO YOU GET IN THE WATER TO SWIM? No, this is a viewing trip only. Sometimes people ask about a pre-board for elderly or handicapped people. This is something we are more than happy to do. The captain personally pre-boards anyone who requests it. 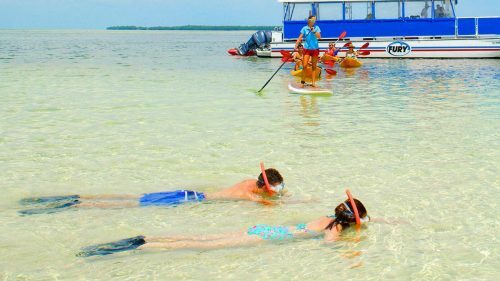 Guests will enjoy 45 to 60 minutes of Snorkeling, 6 to 8 minutes of Parasailing, 15 to 20 minutes of Jet Skiing, and unlimited time kayaking and playing in the waterpark. Wetsuits are available for a fee of $12 per suit. Guests ages 4-13 are not allowed to operate a Jet Ski under any circumstances, but are more than welcome to accompany an adult. Guests 14-15 years of age may operate a Jet Ski with another person on the ski who is at least 18 years of age & meets the required criteria. A parent must be present to sign paperwork at check in. After obtaining a Boater Safety License, guests 16-17 years of age may operate a Jet Ski, when a parent signs paperwork at check in. Drinking alcohol before operating a jet ski is prohibited. If a guest consumes alcohol before jet skiing you will be denied to operate a Jet Ski. Guests may consume alcohol after the Jet Ski portion of their trip. DO YOU NEED A DRIVER’S LICENCE FOR THE JET SKI? All adults 16 years of age and older must present a photo I.D. For breakfast we serve Egg & Cheese Burritos, Fresh Cut Fruit, Yogurt with Granola, assorted Danishes and Muffins & croissants along with Orange Juice. The lunch menu includes a buffet of Turkey & Swiss Sandwiches, Cuban Mix Sandwiches, Veggie & Hummus Sandwiches, Chicken Salad Wraps, Pasta Salad, Key West Cole Slaw and Fresh Baked Cookies. WHAT IF I HAVE NEVER BEEN SNORKELING BEFORE? 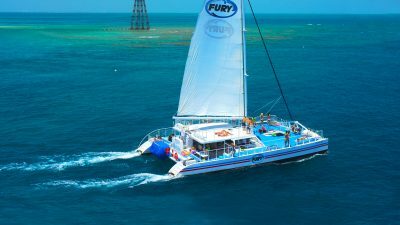 Our experienced and certified Fury crew will give you detailed instructions as you sail out to the Living Coral Reef. 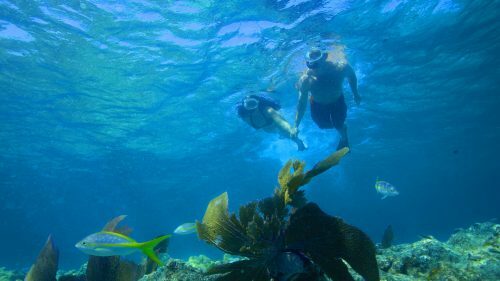 They will go over the best practices and safe snorkel procedures for your day at the reef. Additionally, a crew member will be in the water with you for hands on assistance. 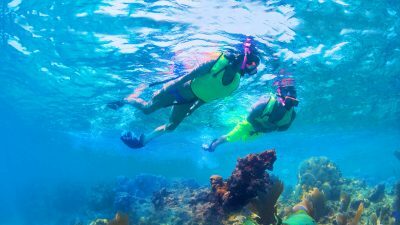 HOW LONG IS THE SNORKEL TRIP AND HOW MUCH SNORKEL TIME DO WE GET? 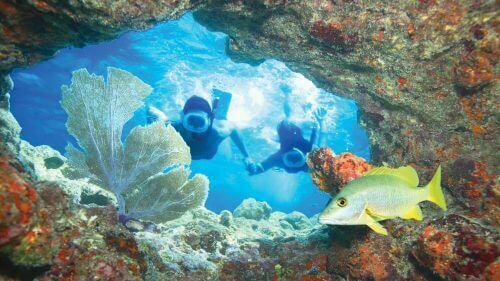 The total snorkel trip time is 3 hours. 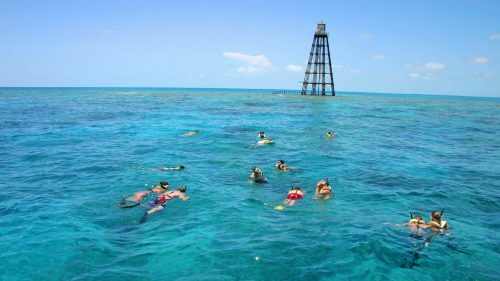 Guests will enjoy an hour to sun and relax as we sail out to reef, an hour of reef snorkeling, and the last hour to continue sun bathing and relaxing as we sail back to shore. 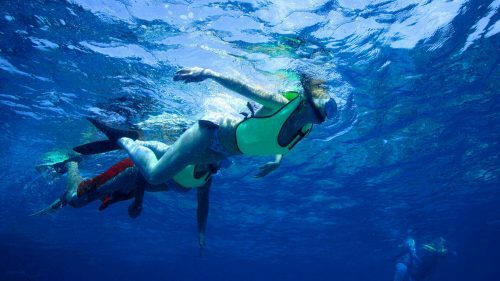 DO YOU HAVE TO KNOW HOW TO SWIM IN ORDER TO SNORKEL? Although it is best for you to be comfortable in the water, you do not have to know how to swim. 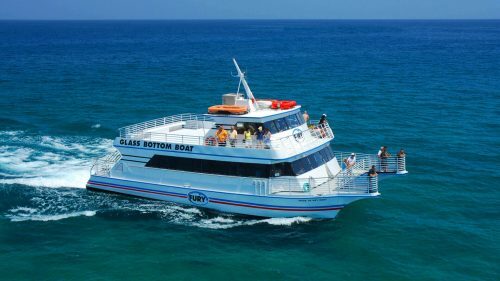 Each guest is provided with a buoyancy compensator (BC) that will assist with flotation so that you can view the reef. Guests should bring a towel & sunscreen. We also recommend an under water camera and a little money to tip the crew! If you forget to bring any items in your room, we will have items available for purchase at the check-in booth. CAN WE BUY FOOD ON BOARD? Complimentary beer, wine, soda, and water are served. You are more than welcome to bring lunch and snacks. IS THERE A POOL ON BOARD? The catamarans have a very spacious sundeck and a fresh water shower. 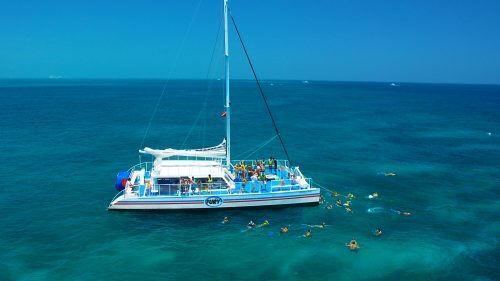 Each Catamaran has a seated sundeck. 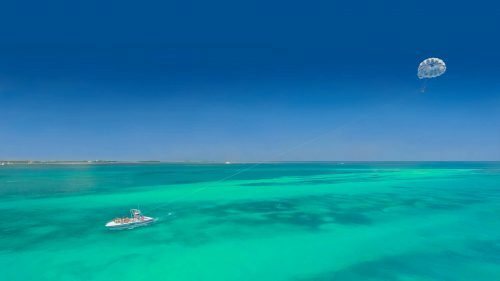 ON PARASAIL, DO I GET WET? Fury doesn’t sail in dangerous weather conditions, but a light shower is not a deterrent. Yes! 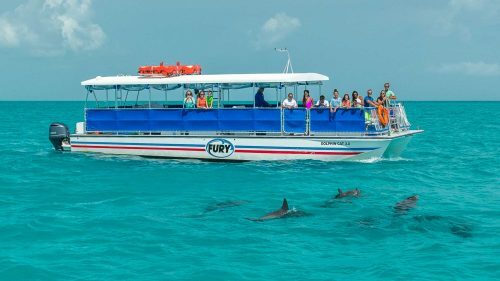 To receive a military discount on any Fury trip, please book through the MWR office on Key West’s Sigsbee base by calling (305) 293-4174. Child rates are for ages 4 to 10. Children ages 3 and under are free (excludes Parasail). For questions regarding your reservation, please call (888) 976-0899 and refer to the confirmation number provided on the next page. Fury tours will not depart in unsafe weather conditions. The Captain will assess the weather and should the Captain determine that the conditions are unsafe to run the tour, the tour may be postponed or it will be canceled. Every effort will be made to reschedule your tour during your stay. If you are unable to re-schedule your tour, you will have the option of receiving a voucher for a future trip. Every effort will be made to run tours, as advertised. Should Fury have to amend or alter your tour due to extraneous circumstances, tickets remain non-refundable on tours taken. Please arrive at your departure point at least 30 minutes prior to the departure time printed on your ticket. 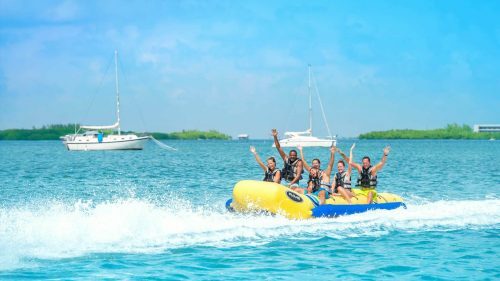 For Ultimate Adventure, Ultimate Express and Jet Ski Tours, please arrive at least 60 minutes prior to departure time. All trips leave the dock promptly at the specified time. You will be asked to present your ticket, as well as a valid form of ID. 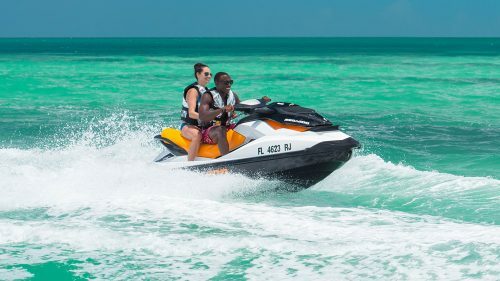 *Credit Card and ID will be required for all all jet ski rentals, boat rentals, Ultimate Adventure and Ultimate Express. Hotel cancellations must be made 7 days prior to scheduled check in date. All cancellations must be made 24 hours prior to your scheduled departure time. Any same day cancellations for tickets purchased or held will be charged in full and are nonrefundable. Please call toll free (888) 976-0899 and refer to the confirmation number provided at the top of the confirmation page. 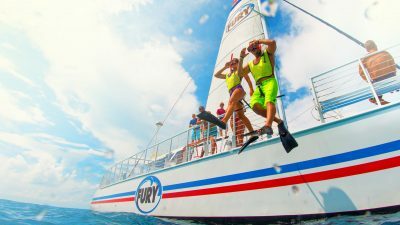 If a trip or rental is cancelled by Fury Water Adventures for any reason, your credit card will be refunded the full amount. By making an online reservation with Fury, you expressly acknowledge that: (i) Fury will send you e-mail(s) with such reservation and other related information and (ii) Fury will send you a survey so that you can evaluate your experience with Fury. Occasionally we will send out emails to our customers concerning special offers or providing information about new products and services we offer. In every email we send, you are given the option to remove yourself from our mailing list. 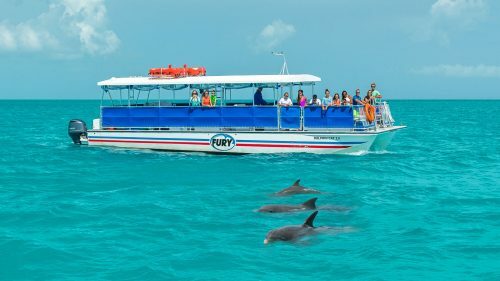 © 2005-2018 Fury Water Adventures Key West ® All Rights Reserved. 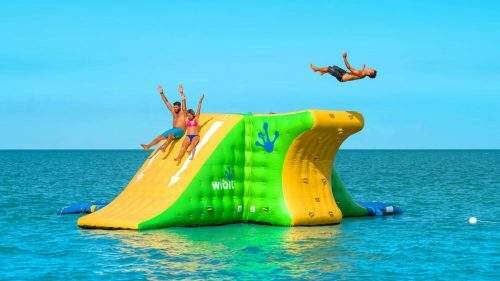 All photos and web site elements are not to be reproduced or used for commercial purposes and are Copyright Fury Water Adventures.